The marriage of Gertrude and Claudius. L to R: Caroline Dunphy, Thomas Hutchins, Polly Sara. Photos (C) Morgan Roberts Photography. 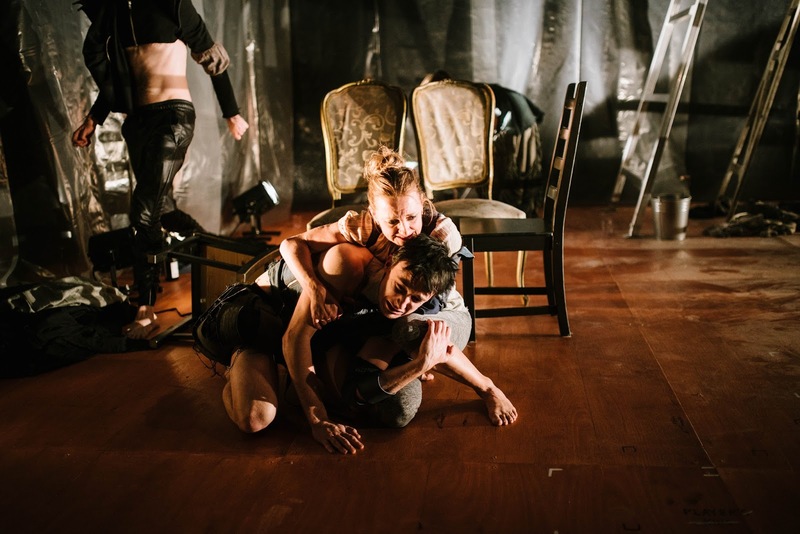 Danger Ensemble’s The Hamlet Apocalypse is chaotic, messy, raw-edged and imperfect. You should go and see it. The premise of the work is relatively simple – seven actors perform Shakespeare’s tragedy Hamlet as the apocalypse approaches. 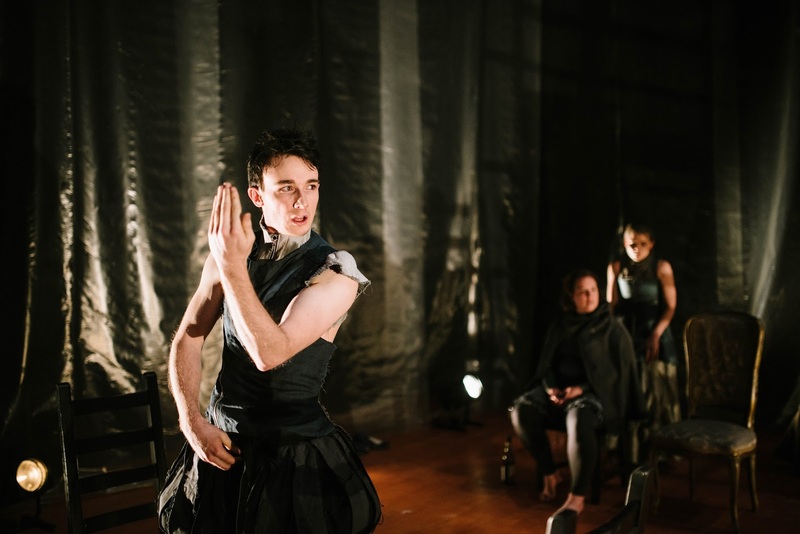 These seven actors are not characters in their own right, but the actors of Danger Ensemble who are performing the show, blurring the lines further between life and art. 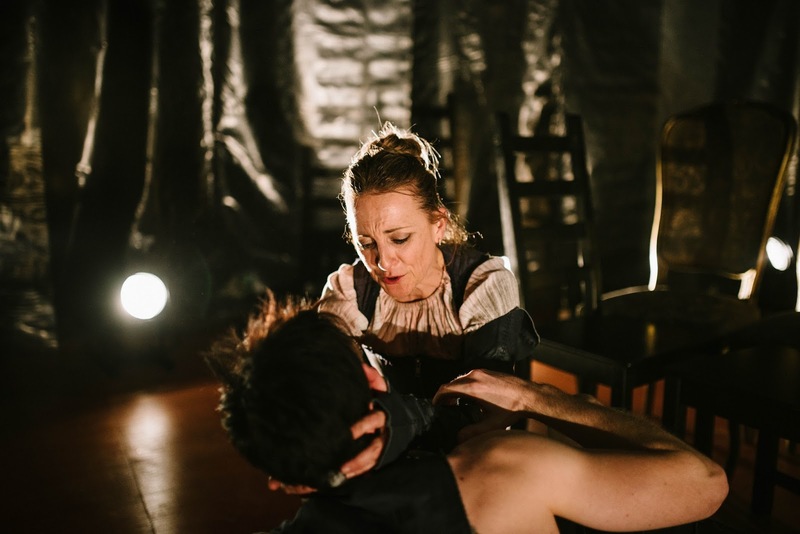 This particular season marks the Danger Ensemble’s ten-year anniversary, and is the fourth season that this company has performed The Hamlet Apocalypse in those years. Photos (C) Morgan Roberts Photography. The opening and closing of the performance tied the whole thing together as the actors introduced themselves to the audience and spoke about the character they would be playing. 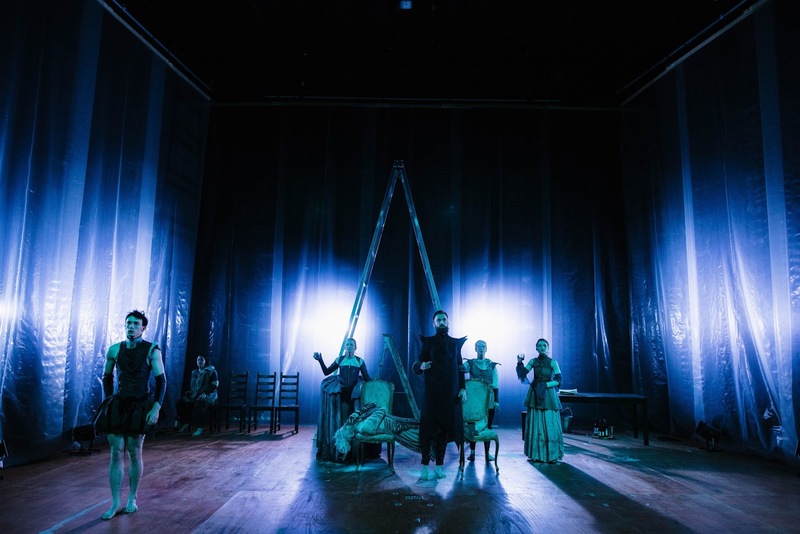 All cast members – Mitch Wood, Caroline Dunphy, Thomas Hutchins, Polly Sara, Peta Ward, Nicole Harvey and Chris Beckey – gave individually engaging and passionate performances in what was surely an emotionally and physically demanding production. Beckey was particularly compelling as the ghost of Hamlet’s father, and Hutchins had a strong stage presence as Claudius, and as himself. The unique structure of the work brought the offstage onstage and blurred the lines between actor and character. Hamlet was played out in the centre, while up the back and off to the side actors laughed together, drank, fidgeted, changed costumes. They contemplated death and destruction, considered final words and final meals, spoke about their wishes and regrets. Caroline Dunphy and Mitch Wood. Interjections of blinding white light and a countdown from ten, as well as the increasing speed of dialogue and action, gave the play a sense of momentum and increasing urgency. However, the flow was regularly interrupted with “offstage” reality and adjustments to stage directions. Shadows playing on the high walls and the flashes of light (lighting design by Ben Hughes) and music composed by Dane Alexander created a sombre mood in the gritty, warehouse-esque setting. 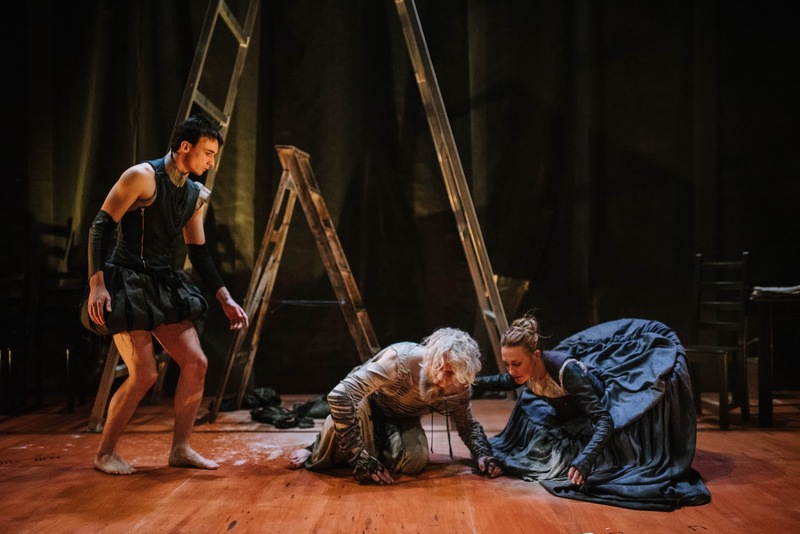 Costumes created by Oscar Clark were ragged remnants, cleverly devised in layers that were stripped away as the play progressed and both the actors and characters began to descend into madness. This stripping away of physical items seemed to play out hand in hand with a stripping away of characters, the actors became more themselves and less Shakespeare’s characters as the end grew near. Whether these parallels were orchestrated or organic, director Steven Mitchell Wright declined to say, preferring to leave everything open to interpretation for the audience. “Whatever you think [it means] is more valid than whatever I intended,” he said. In a post-performance Q&A, director Steven Mitchell Wright spoke about the creation of the work and its evolution to this, the company’s fourth season of The Hamlet Apocalypse. 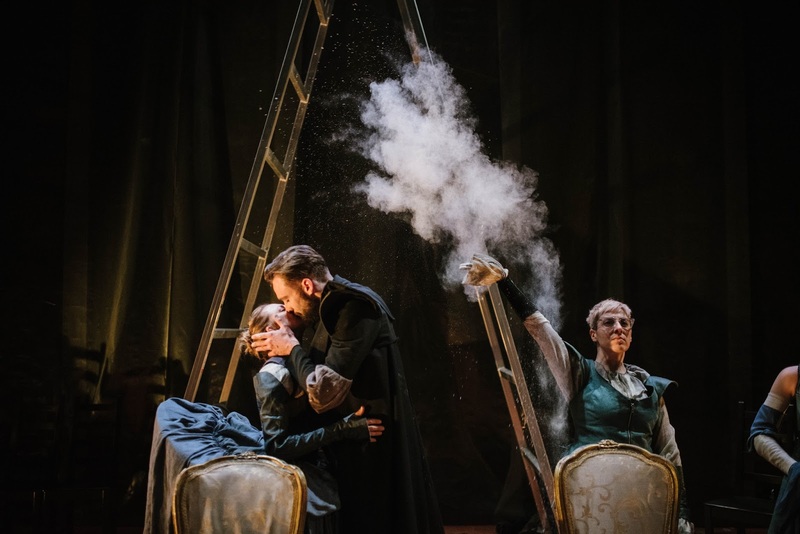 In its ugliness and imperfection, The Hamlet Apocalypsebrings us the true essence of theatre, and of ourselves – would we be kind and compassionate as everything fell apart? Would we remember the lines we were supposed to say, and the steps we were supposed to take? Or would we scrawl cuss words in the dust in the hope that we might be remembered? Top 5: Love Your Bookshop!